"Imagine a day in which you make every green light and slip effortlessly into a parking spot in the most crowded part of town. You make a To Do list, and the people on it call you first. You turn on the radio just in time to hear the exact information you need. You bump into a friend you haven't seen in years, who tells you of an exciting job possibility. These coincidences, called synchronicity, are sure sign you are "in the flow." 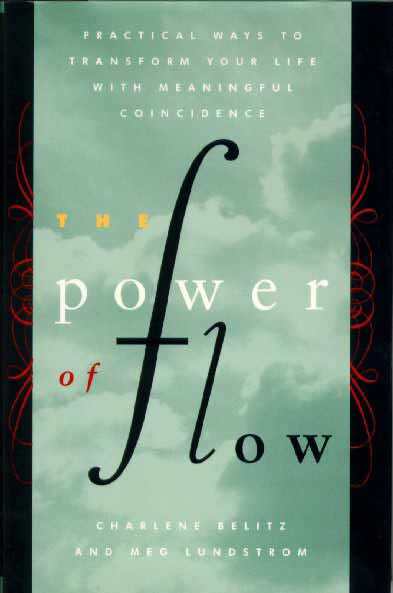 Flow is a harmony of being that has been sought after through the centuries in every spiritual tradition. In the West, flow has been linked to trust, surrender, unconditional love, the grace of God. In the East, it has been linked to the Tao, the unified interconnectedness of the Universe. In our lives, flow is obvious in those times when things happen effortlessly, everything falls into place, obstacles melt away, we feel a deep sense of harmony and underlying order. We know we are in the right place at the right time, doing exactly the right thing." Meg Lundstrom, a widely traveled magazine writer and former newspaper reporter, has written extensively about self-development appraoches and the human search for meaning in relationships, work, and spirituality. She lives in Saugerties, New York, and New York City. Charlene Belitz teaches human communication studies the the University of Denver and the University of Colorado at Denver. She has led huundreds of communication and transformational seminars in corporate, academic, and personal development settings.